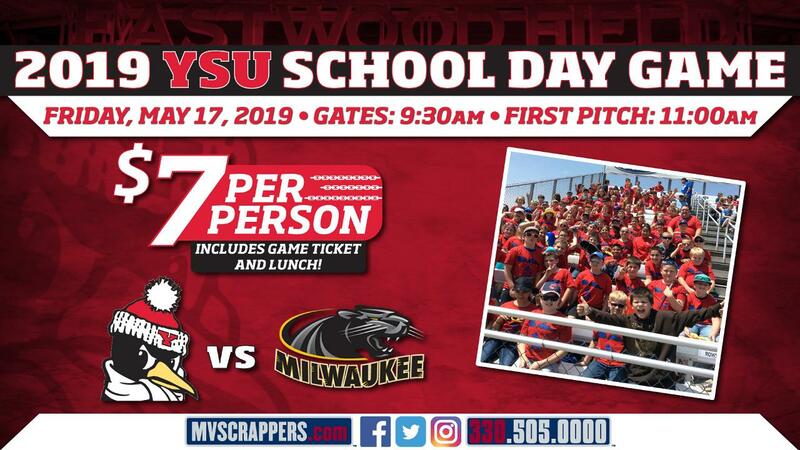 NILES, OH - The Mahoning Valley Scrappers and Youngstown State University are excitd to host the annual School Day Game at Eastwood Field for the 2019 season, presented by Akron Children's Hospital Mahoning Valley. The Youngstown State University Penguins will host the University of Wisconsin - Milwaukee on Friday, May 17, 2019. Gates will open at 9:30am and first pitch is slated for 11:00am. The Scrappers have an afforable package available for area schools. The cost of the school package is only $7.00 per student and includes a game ticket, lunch and an eductional curriculum, which includes many activities for subjects such as Language Arts, Health and Social Studies. The Scrappers are taking reservations and encourage groups to sign up early to guarantee seating. For more information or to reserve your tickets, contact Kate Walsh or Clayton Sibilla at (330) 505-0000 or by email at kwalsh@mvscrappers.com or csibilla@mvscrappers.com. The Scrappers open the 2019 season at Eastwood Field on June 16 vs. the Batavia Muckdogs. Ticket packages are on sale now online at mvscrappers.com, at the Chevy All Stars Box Office at Eastwood Field or by calling (330) 505-0000.